Last Reminder for a Creative Conference Spring! It will be the 5th year an international crowd of people will retreat into the cozy and usually snowy hills of Rückersbach. For 4 days we will share and develop playful approaches to support teams with high-PLAYformance. 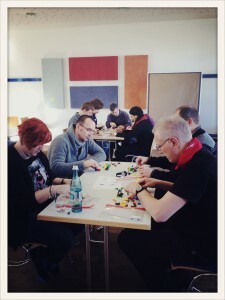 Play4Agile is for Agile and Lean coaches, facilitators, game and innovation experts who want to exchange questions, ideas and experiences on using games in teams and organisations. Play4Agile offers an engaging and open „playground“ to inspire each other and to learn how using serious games can help us achieve our goals. More and less experienced peers from all over the world will create and play games in an inspiring environment. Play4Agile starts end of next week (Feb 20 2015) and is already sold out since months. However, we know by experience that you have a good chance to get in last minute via waiting list. So in case you’re interested, give it at try! 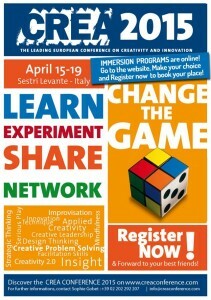 THE Creativity Event in Europe! Crea Conference is the most important annual date devoted to creativity and innovation in Europe. For five days participants focus on the learning and application of methods, on tools and techniques for the development of creative thinking. Each edition 300 participants from over 30 countries contribute to make Crea Conference a great international and multicultural event. The next CREA Conference will be from 15 – 19 APRIL 2015 in beautiful Sestri Levante, Italy. Of course, we will be at both events as organisers and/or session facilitators and would be happy to see you there!